I love the color copper and there’s something endearing about a shiny new penny. I actually pick dozens of them off the streets throughout the year – whether they’re shiny and new or dull, beaten and nearly unrecognizable. On average it amounts to between 75 and 100 cents worth per year. However, the penny (and 2 cent coin) is being literally kicked to the curb around the world. That penny for your thoughts might now cost 5 cents and your 2 cents worth of advice had better up its game. Inflation killed the half-cent or ha’penny coins. For those history buffs out there, they stopped making the US half penny in 1857, over a century before the coin ceased to be legal tender in the UK (1969). A decimalized version of the half penny appeared in the UK and Ireland in 1971 but those bit the dust in 1984 and 1987, respectively. Canada phased out the penny in 2013. Amazingly New Zealand eliminated the 1 and 2 cent coins in 1990 and the 5 cent coin in 2006! Ireland is the next in line to kill the little coppers. After a trial period in County Wexford where if your total purchase ended in .x1 or .x2 it would be rounded to .x0 (e.g. .11 or .12 would be .10); anything ending in 3 or 4 rolled up to 5 as well as 6 or 7 rolling down to 5 (.03 = .05, .27 = .25, etc. ); and the 8’s and 9’s roll up to the nearest dime (.38 = .40), it’s being rolled out countrywide. The Netherlands, Sweden, Finland, Denmark and Hungary already have this type of rounding. I’ve noticed that some retailers are already performing the rounding while others are not. It will likely take a while for all the software that runs cash registers to be programmed to round, and even then, only when the tender is cash. For cashiers who have to balance their tills after their shift, this could be a nightmare, unless they’re given some leeway to cover the rounding. Why the demise? 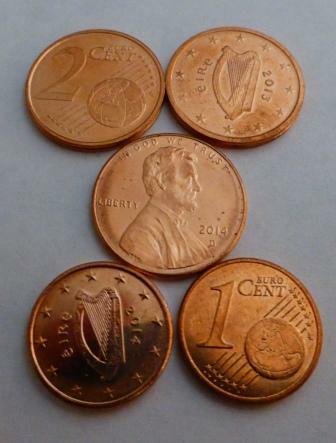 These tiny coins, the smallest denomination in many currencies, just costs more to produce than they are worth – it costs around 1.8 cents to produce a penny in the US and 1.65 in Ireland. What about that jar (or jars) you have stashed in the back of the closet? It is estimated that there are BILLIONS of dollars worth of pennies sitting in cans, jars, and under sofa cushions across the USA and MILLIONS in Ireland. They are all still legal tender and can be used as payment. They just won’t be given anymore as change in Ireland. The debate still rages in the US over whether to keep the one cent coin or not, but in many places, it already a goner. I’ve still got a small stash – maybe they’ll become collector’s items to aid in funding my retirement. I really get the age thing as it does get harder, I just consider it part of my exercise routine these days (though I probably do skip the odd one or two when I’m tired).